Among the 10 states with the largest number of low-income men (“the top 10 states”), rates of private and public insurance coverage vary widely (figure 1). Low-income men in Pennsylvania (36 percent), Ohio (33 percent), and Illinois (30 percent) have the highest rates of private insurance only. Private insurance rates are lowest in New York (25 percent). Figure 1 also shows that low-income men in states with the lowest public insurance coverage have the highest uninsured rates: Texas (63 percent), Florida (60 percent), and Georgia (59 percent). Low-income men in states with the highest rates of public insurance (New York and Michigan) are the least likely to lack any health insurance coverage (42 and 43 percent, respectively). Source: ASPE tabulations of the American Community Survey (2008–10). Notes: Low-income men are ages 18–44, live in families with incomes below 200 percent of the federal poverty level, and do not have four-year college degrees. “Top 10 states” are states with the largest populations of low-income men. As shown in figure 2, the states with the highest uninsured rates for low-income men (above 50 percent) are located primarily in the southeast (Arkansas, Florida, Louisiana, Mississippi, North Carolina, South Carolina, and Georgia), the southwest (Texas, Oklahoma, New Mexico, and Colorado), and the west (California and Nevada). Northern areas of the country tend to have lower rates of uninsured men. The District of Columbia (23 percent) and Massachusetts (21 percent), Hawaii (26 percent), and Vermont (28 percent) have the lowest uninsured rates (data not shown). Massachusetts and Vermont have state health care systems designed to expand coverage to low-income populations, as does the District of Columbia. Public insurance coverage across the states appears to follow a similar pattern to that of uninsured rates. 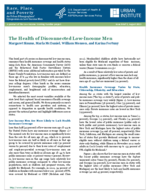 Low-income men have the lowest rates of public insurance coverage in the south and midwest (Georgia, Nebraska, Utah, Kansas, Wyoming, Idaho, Texas, and Nevada) at 12 percent or below. Northeastern states (New York, Maine, Massachusetts, and Vermont) have the highest public insurance rates for low-income men: at or above 34 percent. Low-income men in the District of Columbia have the highest public insurance rate (48 percent). Among low-income men nationally, Hispanics are the most likely to lack health insurance coverage (66 percent), followed by African American men (48 percent).6 White men have the lowest uninsured rate (41 percent).7 Many Hispanic men are foreign born and may not qualify for public health insurance coverage depending on their citizenship and immigration status (Kenney and Huntress 2012; Motel and Patten 2012). Uninsurance rates do vary by citizenship status. Low-income men who are noncitizens, a group that includes both lawfully present immigrants and undocumented immigrants, have the highest uninsured rate (74 percent). The uninsured rate for foreign-born men who are naturalized US citizens is the same as the uninsured rate for native-born men (45 versus 44 percent). Note: Low-income men are age 18–44, live in families with incomes below 200 percent of the federal poverty level, and do not have four-year college degrees. In relation to educational attainment, low-income men without high school degrees or GEDs have the highest uninsured rate (61 percent), more than one and a half times higher than the uninsured rate for men with associate’s degrees (38 percent). The uninsured rate for low-income men with a high school degree or GED, but not a college degree, falls in the middle (52 percent).